Hugo Grenville first exhibited in London at the Chelsea Arts Society at the age of 15, although it took him another 14 years to become a full time painter. After leaving school he travelled the Hippy Trail to India, ran out of money, joined the Coldstream Guards and served as an officer in Northern Ireland, West Africa, Rhodesia (Zimbabwe) during the Civil War, and finally as an Aide-de-Camp to C-in-C British Army of the Rhine, during which time he painted whenever possible, and studied part-time at Chelsea School of Art and Heatherley’s. Working first in advertising and then as an art dealer, he finally submitted to the need to paint full-time at the age of 30. 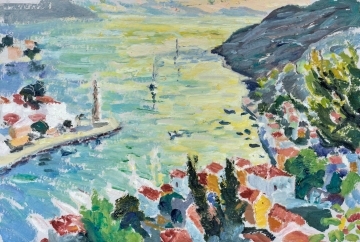 With 20 one-man shows under his belt at major galleries in London, New York and Palm Beach, Hugo has forged an enviable reputation as one of the country’s leading colourist painters, resulting in invitations to lecture and teach from institutions such as Falmouth School of Art and the V & A Museum. His fabric designs were included in the Liberty’s Spring/Summer Collection of 2011, and he was short listed for the Threadneedle Prize in 2013. In 2016, Hugo was invited to have a one man show at Studio 2000, Holland. 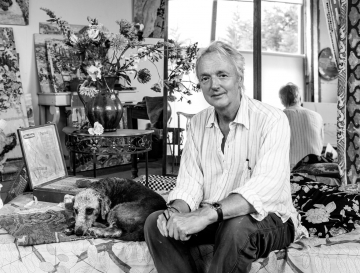 During his career he has painted many portraits of leading figures, including the late Archbishop of Canterbury Lord Runcie, and the counter-tenor Michael Chance in the role of Orpheus at the ENO; he was an Official War Artist in Bosnia in 1995, and has been commissioned by a number of institutions including the Worshipful Company of Ironmongers, Edinburgh City Council and The China Club, Hong Kong. (HG1202) Oil on Board 15" x 21.5"